Aminah Mae Safi talks to us about Not the Girls You’re Looking For, a story that explores ideas of identity, girlhood, and the complicated and powerful nature of female friendships. Give us a quick elevator pitch about what your new novel Not the Girls You’re Looking For is about. Not The Girls You’re Looking For is my ode to mean girls, messy friendships, and bad decisions. It follows Lulu Saad — a Muslim American girl — as she and her friends go through their junior year at a Texas prep school. Lulu is spectacularly good at screwing up and mouthing off, so the story also explores what it means to hurt those you love most in the world and how any of us can recover from that. I wrote Lulu for my teenage self. I needed her. I waited for someone, anyone to write her. Turns out, I had to do it myself. So I wrote about a girl who lives in a rarefied world. A world most daughters of immigrants don’t get access to. She understands it’s a privilege, but also, she’s a bit resentful of it. I wanted to give her room to screw up, but also, room to hope for the future, room to be able to grow. I also stand on the shoulders of giants. Authors who have done the work of making narratives that show that assimilation is not the only option for immigrants and children of immigrants. That those characters can be proud of the culture and the heritage that they bring to the United States. Because those writers have done that work — I got to write a story that was about how that is, in my mind, a false choice that immigrants have to make. That children with mixed-race or mixed-heritage have to make. Pick one or the other, never both. Assimilate and erase or refuse to assimilate and pay the consequences. When you don’t fit neatly into pre-made identity boxes, the lived reality is much messier and much more nuanced. I wanted a story that showed a protagonist living in that mess and realizing that it was, ultimately, going to be okay. To be able to reach out and communicate across and between cultures is such a gift. It didn’t feel like it growing up. But I know it is now. One of my absolute favorite things about this book is how realistic and raw and honest the female friendships are. Can you talk a little bit your experience writing them the way you did? Like Lulu, I didn’t have sisters growing up. I felt like I was on the outside, looking in — my face pressed against a bakery window, really, at my friends who had sisters. But I think most of us make sisters out of the friends we have. There’s a tenacity to female friendships that we just don’t get all that often in any kind of media. I think this is largely a byproduct of the fact that we don’t get many stories centered on groups of women all that often (and why women and young women cling to those stories they do get, like Beaches or Mean Girls or Heathers or Sisterhood of the Traveling Pants). There’s also the ways your friends— and only your friends— can hurt you. Particularly when you feel like they aren’t seeing you or aren’t listening to you that I think is so important at this age. You grow and change so fast as a teenager that there’s this sense of bewilderment with your own friends. They’re supposed to know you better than anyone, but sometimes, they don’t seem to understand you at all. I didn’t want to write perfect friendships where nothing went wrong. I also didn’t want to write— at least in this book— about toxic friendships or friend breakups. Most of us live in between those two— the friends who we love, who we struggle to protect, who we know exactly what soft targets to hit when we’re upset. But, honestly, I wrote female friendships as I know them. The women I have known in my life would do anything for their friends. My 2 A.M. emergency dial has never been a dude and I’m married (sorry, babe). I feel so lucky that I got to write about that and I feel even more honored that it’s resonated with readers. The prose in this novel is just absolutely gorgeous – seriously, my entire copy is just full of highlights. What’s one passage or quote from the book that you consider to be your favorite and why? Thank you! That is so wonderful to hear! I have several passages I love, mostly because I fell in love with these girls and their friendship as I wrote them. But one I’m particularly proud of is from this moment where Lulu’s talking about her nickname and a boy comes in and starts singing Eric Clapton’s Leila at her. And she, understandably, gets annoyed. I love that Lulu tells us that. I love that, right off the bat, I knew what she was struggling with and struggling against from that dialog. She was a bit of a tricky character to get to open up. But I could keep going back to this passage as I wrote. It’s such a touchstone moment for Lulu. Apart from Lulu, who was your other favorite character (or characters) to write and why? Okay, Lo is so much fun to write because she is just so unapologetically herself. She’s also the best kind of Slytherin— ferocious, cunning, loyal. I love that about her. I wrote her knowing that she’d be pretty polarizing to people and that was much of my early feedback about her. But she didn’t change at all through re-writes. Because I loved writing a girl who is, in so many ways, that girl and then actually getting to write her as a full, human character. Girls like Lo don’t show their weaknesses often, and I loved finding her vulnerabilities and writing them in a way for the reader that I hope made you understand what life looks like from her perspective. Lulu’s dad— Ahmed— was also fun to write. I gave him my love of history. Every time he’s giving someone a lecture about history that is fully me, pushing up my glasses and getting extremely excited about an event that happened three hundred years ago. It was great to be able to slip that piece of myself into the story. Also, Matt. He’s so grumpy. Grumpy characters are the best because they don’t hold back and they tell everyone exactly what’s on their minds. I loved getting to put him to comedic good use. What do you hope people learn from Lulu? Oh, man. So many things. That everyone is fighting their own battles in this world. That we all have the power to hurt or help those around us. It’s in third person but we’re solidly with Lulu’s perspective for the story and I wanted to use that to show all the ways people around her have hurt her— as they’ve affected her emotions and her way of walking through the world. But then I wanted to use that limitation on the story so that when other characters reveal their own hurts and struggles, the reader can experience themselves how Lulu missed her own blind spots. Because we’ve all got those blind spots— or at least, our versions of them— we’ve all got stuff we can’t see. I hope anyone out there who identifies with Lulu— as the child of an immigrant, a Muslim-American, a mixed-race kid, a girl, any combination or variation on the above— sees themselves. I hope they know their stories are valid, are real, are important. I hope they see that they don’t have to be perfect, model versions of whatever marginalized group that they belong to in order to believe they have a right to space in this world. What do you hope people learn from the story? I’d also love for anyone— but young women especially— to know that they can screw up and that they can make amends and move on. You’re not your worst days. You’re not stuck being your worst self. So often when we talk about women saving themselves, it’s from an attacker, a burning building, a physical situation. But you can psychologically and emotionally save yourself, too. We don’t tell that enough to young women. That you can dig deep inside yourself and find your own way through the world. It’s not easy and looking your own misdeeds in the eye is never pleasant, but that’s where growth happens. I’d also love for people to take away that forgiveness is a gift we give ourselves. And that earning forgiveness, making restitution, is about our actions. An apology is one kind of action, but it’s not the only one. But really— I’m not in charge of any of that. Readers are going to take away what they’re going to take away. I hope I did my job right and those themes come across. And if nothing else, I hope they enjoyed the time they spent reading my work. 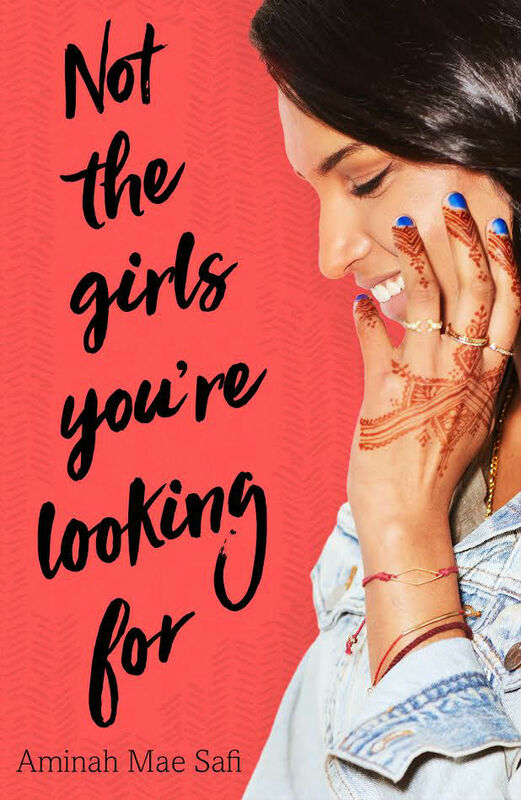 Aminah Mae Safi’s Not the Girls You’re Looking For will be out June 19! Pre-order it now from Amazon, Barnes & Noble, or from your local indie bookstore. And don’t forget to add it to your Goodreads!